Should electronic cigarette producers be prohibited from advertising and be taxed? Electronic cigarettes (e-cigarettes) are a non-combustible alternative to smoking. As opposed to smoking cigarettes, the use of e-cigarettes delivers nicotine to the user without exposing that person to tar, the substance in cigarette smoke responsible for most of its harm. In all e-cigarettes a liquid containing nicotine is vaporised by a battery powered heating device. Participation in the use of e-cigarettes has increased dramatically since they were first introduced in the US in 2007. According to the top panel of Figure 1, participation among adults grew from 0.3% in 2010 to 6.9% in 2014. Participation among 18-24 year-olds was approximately double that of adults of all ages over the years in which data for the former group are available. The figure depicts similar trends for youth. Participation by youths in grades 6 (age 11-12) to 12 (age 17-18) increased from 1.0% in 2011 to 11.3% in 2015. Sources: (1) National Adult Tobacco Survey (2012-2014), McMillen et al. (2015) for 2010 and 2011. Figures for overall population comparable from both sources for 2012-2013; (2) National Health Interview Survey (2005-2015); (3) National Youth Tobacco Survey (2006-2015). Concurrent with the surge in e-cigarette participation, there has been a substantial increase in advertising from $3.6 million in 2010 to $112 million in 2014, with the vast majority of spending devoted to magazines (59%) and television (27%) with national reach (Kim et al. 2014, US Surgeon General 2016). In a 2013 sample of Florida residents, almost 48% of adults had been exposed to e-cigarette marketing (Kim et al. 2014). Youth and young adult exposure was at least equal to 10% at the national level in the same year (Duke et al. 2014). E-cigarettes: Harm reducing, or addiction forming? E-cigarette participation and advertising have surged during an extremely contentious policy debate. At the heart of this regulatory debate are fundamental questions regarding whether e-cigarettes will draw cigarette smokers away from a dangerous habit or lure new initiates into tobacco use and lead to a new generation of nicotine addicts. On one side of the debate is the argument that e-cigarettes constitute a tobacco harm-reduction strategy. While e-cigarettes are not a completely safe alternative to cigarettes, in April 2016 the Royal College of Physicians in Great Britain issued a report urging smokers to switch to e-cigarettes (Royal College of Physicians 2016). That echoed advice some physicians had started giving to their patients who smoked (Kandra et al. 2014). The recent trends in US smoking rates provide hints that the growth of e-cigarette participation might be helping reduce smoking. The bottom panel of Figure 1 highlights the well-known downward trend in adult smoking – the rate fell from 20.9% in 2005 to 15.1% in 2015. 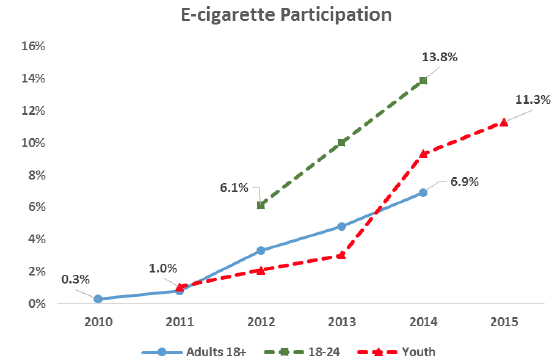 During the 2011-2015 period in which data on e-cigarette participation are also available, adult smoking participation fell by almost four percentage points. In other national data, Zhu et al. (2017) find that the quit attempt rate and annual cessation rate were higher in 2014-15 compared to surveys earlier in the 2000s prior to the surge in e-cigarettes participation. 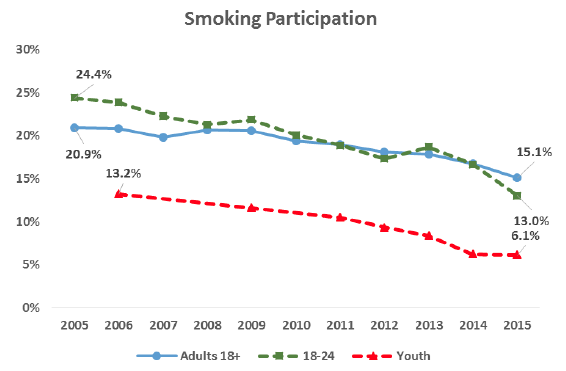 The bottom panel of Figure 1 further shows that the growth in e-cigarette participation among youth was also accompanied by a downward trend in youth smoking. On the other side of the policy debate are several arguments that suggest caution about e-cigarettes (US Food and Drug Administration 2016b, US Surgeon General 2016). There is no research on the long-term health effects of e-cigarette use. Nicotine exposure during the prenatal period is harmful. Adolescent nicotine exposure via e-cigarettes may have lasting adverse consequences for cognitive development. Accidental poisoning can result from the damaging of e-cigarette products as reflected by the large increase in the number of calls to poison centres involving e-liquids. The greatest danger may be that these products may prompt some adolescents towards a path of nicotine addiction, first by using e-cigarettes and then transitioning into smoking. The general debate over e-cigarettes has carried over to the regulation of e-cigarette advertising. In the US until 2016, e-cigarettes were regulated as an ordinary consumer product and allowed to advertise as long as they did not make health or cessation claims. In 2016, the Food and Drug Administration (FDA) extended its authority over tobacco products to include e-cigarettes. The FDA announced regulations that would ban the sale of e-cigarettes and related products to minors effective immediately and would require advertisements to carry warnings that the product contains nicotine, which is addictive, effective in August 2018. In addition and also effective in August 2018, all products that were not commercially marketed prior to 15 February 2007 would have to submit marketing applications (US Food and Drug Administration 2016a). Because the marketing application approval process can be quite lengthy and the cost of preparing it has been estimated at between $200,000 and $2 million by the FDA, it has the potential to eliminate many current producers and result in significant price increases. In July 2017, FDA Commissioner Scott Gottlieb indicated marketing applications will not be required until August 2022 and that he would consider endorsing e-cigarettesas a method to quit smoking (Kaplan 2017). The status quo remains that e-cigarette manufacturers are allowed to advertise in magazines, television, and other media in the US, although the advertisements will have to carry warning labels starting in August. In 2016, however, the European Court of Justice, Europe’s highest court, found that the EU had the right to regulate e-cigarettes, including banning advertising (Jolly 2016). Moreover, this March seven health and medical groups sued the FDA over the four-year delay in the marketing applications requirement (McGinley 2018). US tax policy with regard to e-cigarettes also is in a state of flux. Seven states and the District of Columbia have excise taxes on e-cigarettes. Many other states have also considered imposing a tax. The FDA lacks statutory authority to impose a federal excise tax on the product, although two bills pending in Congress would give it that authority (Camacho 2017, Troutman Sanders LLP 2017). The imposition of these taxes, like the marketing requirements application, will result in higher prices. Would advertising restrictions and taxes on e-cigarettes discourage people from quitting traditional cigarettes? In two recently completed studies, we provide evidence of the effects of restrictions on advertising and the imposition of excise taxes on decisions by adults to stop smoking combustible cigarettes (Dave et al. 2018, Saffer et al. 2018). In the first paper (Dave et al. 2018), we use extremely detailed information on TV viewing patterns and magazine issues read in the Simmons National Consumer Survey and match this information to all e-cigarette ads aired on national and local broadcast and cable stations and all ads published in magazines from Kantar Media. The match yields estimates of the number of ads seen and read by each survey respondent in the past six months. We find that e-cigarette ads seen on television increase the probability of quitting smoking, but ads read in magazines do not. Our results indicate that a policy to ban TV advertising of e-cigarettes would have reduced the number of smokers who quit in 2015 by approximately 3%, resulting in roughly 105,000 fewer quitters in that year. On the other hand, if the FDA were not considering regulations and mandates that would likely eliminate many e-cigarette producers during our sample period, e-cigarette ads might have reached the number of nicotine replacement therapy TV ads in 2015. That would have increased the number of smokers who quit by around 10%, resulting in an additional 350,000 quitters. In the second paper (Saffer et al. 2018), we attach e-cigarette prices in states in which individuals reside in the Tobacco Use Supplements to the Current Population Survey. We report that the probability of quitting smoking falls as the price of e-cigarettes rises. Our results imply that the imposition of a 10% federal excise tax on the price of the product would, if fully shifted to consumers, reduce the number of quitters in the US by more than 250,000 in 2015. Our results and those in Majeed et al. (2017) should give pause to those who advocate a complete ban on e-cigarette advertising and stiff excise taxes on the product. Majeed and colleagues find that the perceived harm of e-cigarettes among US adults rose between 2012 and 2015. Most strikingly, there was a four-fold increase in the number of adults who perceived e-cigarettes to be more harmful than cigarettes. In light of contradictory evidence in the medical literature, these trends point to a lack of information about a product that potentially is harm- reducing. Of course, it is far too early for us or other investigators to conclude that unrestricted advertising of e-cigarettes and low or no federal taxation would advance public health. Medical researchers need to investigate the long-term health consequences of the use of e-cigarettes. Although the FDA has already banned the sale of e-cigarettes and related products to minors, economists need to investigate the role of e-cigarettes in initiation of nicotine use by youths. We do not know if youths, who otherwise would have smoked cigarettes, use e-cigarettes instead. We also do not know if the use of e-cigarettes attracts youths who would not have become smokers to begin smoking cigarettes. Camacho, A (2017), “Extras on Excise: While States Start Taxing E-Cigarettes, Proposed Federal Restrictions Go Up in Vapor”, Bloomberg Tax, 18January. Dave, D, D Dench, M Grossman, D S Kenkel, and H Saffer (2018), “Does E-Cigarette Advertising Encourage Adult Smokers to Quit?”, NBER Working Paper 24277. Duke, J C, Y O Lee, A E Kim, K A Watson, K Y Arnold, J M Nonnemaker, and L Porter (2014), “Exposure to Electronic Cigarette Television Advertisements Among Youth and Young Adults”, Pediatrics 134(1): e29-e36. Jolly, D (2016), “European Court of Justice Upholds Strict Rules on Tobacco”, New York Times, 4 May. Kandra, K L, L M Ranney, J G L Lee, and A O Goldstein (2014), “Physicians’ Attitudes and Use of E-Cigarettes as Cessation Devices, North Carolina, 2013”, PloS one 9(7): e103462. Kaplan, S (2017), “F.D.A. Delays Rules That Would Have Limited E-Cigarettes on Market”, New York Times, 28 July. Kim, A E, K Y Arnold, and O Makarenko (2014), “E-cigarette Advertising Expenditures in the U.S., 2011-2012”, American Journal of Preventive Medicine 46(4): 409-412. Majeed, B A, S R Weaver, K R Gregory, C F Whitney, P Slovic, T F Pechacek, and M P Eriksen (2017), “Changing Perceptions of Harm of E-Cigarettes Among U.S. Adults, 2011-2015”, American Journal of Preventive Medicine 52(3): 331–338. McGinley, L (2018), “FDA Sued for Delaying E-Cigarette, Cigar Regulations”, Washington Post, 27 March. McMillen, R C, M A Gottlieb, R M Whitmore Shaefer, J P Winickoff, and J D Klein (2015), “Trends in Electronic Cigarette Use Among U.S. Adults: Use is Increasing in Both Smokers and Nonsmokers”, Nicotine and Tobacco Research 17(10): 1195-1202. Royal College of Physicians ( 2016), Nicotine without Smoke: Tobacco Harm Reduction. Saffer, H, D Dench, D Dave, and M Grossman (2018), “E-Cigarettes and Adult Smoking”, NBER Working Paper 24212. Troutman Sanders LLP (2017), “Bills that Would Expand and Increase the Tobacco Excise Tax Pending in Congress”, Tobacco Law Blog, 7December. US Food and Drug Administration (2016a), “Deeming Tobacco Products To Be Subject to the Federal Food, Drug, and Cosmetic Act, as Amended by the Family Smoking Prevention and Tobacco Control Act; Restrictions on the Sale and Distribution of Tobacco Products and Required Warning Statements for Tobacco Products; Final Rule”, Federal Registrar, 10May. US Food and Drug Administration (2016b), “FDA Warns of Health Risks Posed by E-Cigarettes”. US Surgeon General (2014), The Health Consequences of Smoking—50 Years of Progress, Rockville, MD: Office of the Surgeon General, Public Health Service, US Department of Health and Human Services. US Surgeon General (2016), E-Cigarette Use Among Youth and Young Adults: A Report of the Surgeon General, Rockville, MD: Office of the Surgeon General, Public Health Service, US Department of Health and Human Services. Zhu, S-H, Y-L Zhuang, S Wong, S E Cummins, and G J Tedeschi (2017), “E-Cigarette Use and Associated Changes in Population Smoking Cessation: Evidence from US Current Population Surveys”, British Medical Journal 358(j3262): 1-7.